A fantastic twist on the traditional savoury pizza. This will sure be a hit. Cut the green tops from the strawberries. Cut Victorian Strawberries in half; place in a bowl and set aside. Place almonds on an oven tray. Bake 2-3 minutes or until lightly golden (be careful they don’t burn). Remove from oven and set aside. Check that you have a medium sized heatproof bowl that securely fits on top of a saucepan. Fill the saucepan about 3cm deep with water and place over a medium heat until simmering. Turn the heat to low. Break the chocolate into pieces and place in heatproof bowl along with the cream. Place bowl on the saucepan. Stir chocolate/cream mixture until smooth. Remove from heat, keeping bowl on top of saucepan. Set aside. Grease a large pizza pan liberally with butter. Leave pastry on bench for about 5 minutes or until partially thawed. Place a 25cm diameter plate on top of the pastry and using the plate as a guide, cut out a circle. Place circle on greased pan. Prick all over with a fork (this stops the pastry rising). Bake 20 minutes or until lightly golden. Remove from oven. Keeping the pastry on the tray, set aside to cool for 10 minutes. Spoon chocolate mixture onto pastry and spread with the back of a spoon leaving a 1.5 cm border around the edge. Top with White Melts. Place back in the oven for 1 minute or until White Melts are just melted. Remove from oven. 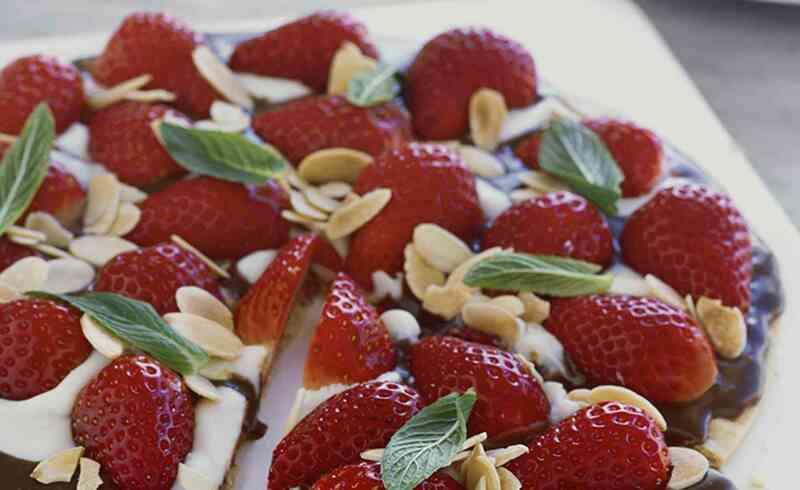 Arrange strawberry halves on top of pizza, and then scatter with almonds. Garnish with mint leaves.